As a big fan of Daft Punk, I’ve always wanted to know more about their story. How did they rise from no name house DJs to who they are today? For my final project in the HCI course, “Programming Usable Interfaces”, I developed an interactive website to illustrate the history of Daft Punk. 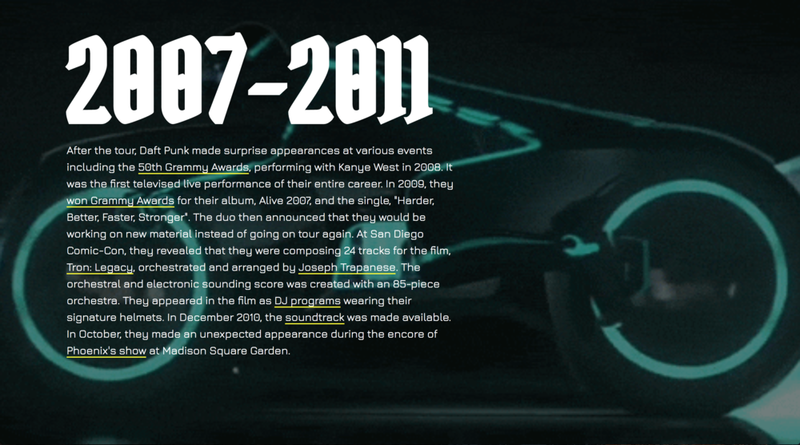 The website displays information about Daft Punk in chronological order, with the first bit of information dating back to 1987. The timeline advances as visitors scroll further down the page. The timeline concludes with a paragraph on what the artists are up to today in their career. I coded the website using HTML, CSS and Skrollr.js. In doing this project, I learned how to incorporate scrolling animations to a website. I decided to embed reference images and videos throughout the text to provide visitors with more context around what they are reading. Also, I added in a way for people to listen to the songs and albums being referenced through their Spotify web player. The added imagery and audio elevates the information to be more than just text on a page. View Website — Video coming soon!